Walking is an excellent activity for improving your health, increasing your fitness and endurance, and even managing stress. For most individuals, it’s an easy exercise that requires nothing but a good pair of walking shoes. Walking can be enjoyed as personal time for yourself, or a social activity when walking with family or friends. How Can Fitness Walking Benefit Your Health? Fitness walking at a brisk, steady pace can be an aerobic workout that can improve your cardiovascular fitness and endurance. It’s low-impact, easy on your joints with low risk for injury, and can strengthen and tone the muscles in your legs, buttocks and torso. Walking can also increase bone density, maintain joint mobility and decrease back pain. Some of the other health benefits a regular walking program can provide include weight management and burning calories for weight loss; improved cardiovascular health, blood pressure, and cholesterol levels; and lowering the risk of type II diabetes. 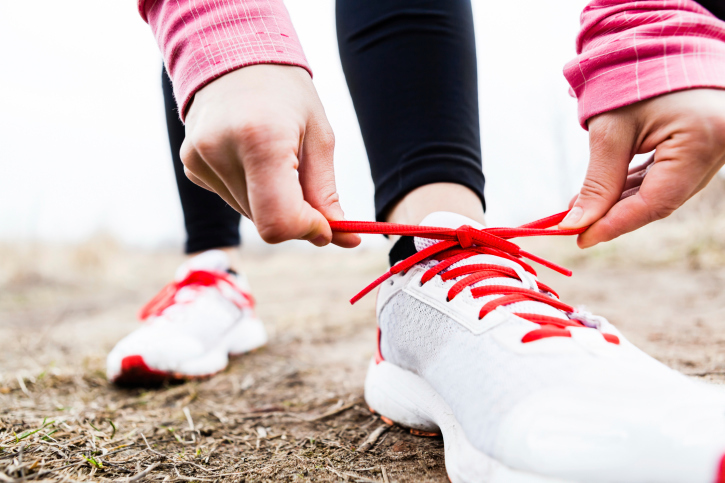 Walking is a great way to get started with an exercise program. It can be your primary fitness activity, or one component of a multi-activity exercise plan. You can walk for exercise, to relax or unwind after a busy day, or to help you achieve fitness goals. For example, many fitness walkers have gone a step further, joining the running world in training for 5K and 10K race events and even competing in half or full marathons! Walk on a bike path or long stretch of road to avoid the stop-and-go slowdowns caused by crossing streets or waiting for traffic lights. A high school track can also provide a safe and continuous walking path. Increase your walking speed by taking smaller, faster steps. Resist the urge to increase your stride length. Listen to high-energy music and keep pace with the beat. 115 – 130 beats per minute is a good walking pace. Here’s a great trick for increasing your pace: Swing your arms faster and your legs will automatically follow! When walking with a buddy or group, assign a “pace keeper” to keep the group walking at a brisk and steady speed while enjoying the conversation and camaraderie. Another great way to challenge yourself is with interval training, which alternates short bursts of high-intensity activity with lower- to moderate intensity recovery periods. The intervals can be timed–for example, 30-seconds of high-intensity activity and 1 minute of lower-intensity recovery. Or, intervals can be very loose–for example, by changing your intensity every block you walk or following the verse and chorus of a song. Here are a few examples of walking interval workouts that can help you boost your intensity and burn more calories! Alternate a fast, brisk walking pace with a moderate pace in 1:3 minute ratios or 1:2 minute ratios for a more advanced workout. Choose a walking route with hills or stairs, keeping a steady walking pace and repeating the climbs when possible. If you’re on a treadmill, increase the incline so you are walking uphill for your challenge interval. Walk around a high school track and climb the bleacher stairs a couple of times between each lap. Whether you’re walking for health, fitness, or leisure and recreation, there is no better time to get started than the present! If you are a Health Advocate member with access to Wellness Coaching, call your coach for more great tips to get you moving! Ask a Health Advocate: How can I stay healthy while I’m on break?